In 2018, we are celebrating 13 years of providing veterinary care in your community. We offer very special care for your dogs and cats, as well as birds, small pocket pets and reptiles. We are pleased to offer you and your best friend the very best in compassionate veterinary care in Sarasota. Our experienced staff are always pleased to assist you in any way to make visits to our veterinary clinic run as smooth as possible. It is our belief that through exceptional customer service, in-depth veterinarian education about pet needs, and outstanding veterinary medicine, we can have a profound impact on the quality of your pet's life. When you visit us you'll find out why our veterinarians receive constant praise for their kind and thorough care. Call us now to set up your appointment with Dr. Madonna Fugent, Dr. Tammy Clarkson, or Dr. Holly Weber. Click on the Facebook link to see testimonials, a gallery of our best friends and to follow us. We have a number of resources for you to learn about how to take better care of your pets. Browse around and look at our articles and pet videos. The best veterinary care for animals is ongoing nutrition and problem prevention. If you want to ask a question call 941-927-4567 and we'll promptly get back to you. 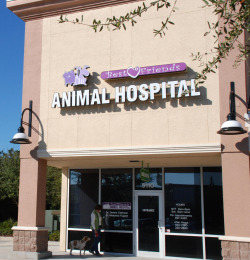 Our Sarasota veterinary office is very easy to get to, and you can find directions on our Contact Us page. You can also subscribe to our newsletter which is created especially for Sarasota pet owners. In between your veterinary visits, your pet will benefit from you reading these free informative articles. At Best Friends Animal Hospital, we treat your pets like the valued family members they are. "The vets and staff took great care of my dog when he was poisoned and are very caring and responsive. I would highly recommend them to anyone. They were wonderful with my very timid dog, he has no fear when he walks in and everyone greets him by name."